Dr. Al and the Sudbury Smiles Team are proud to welcome patients to our dental office in Sudbury, ON. We are a general dentist office that provides services from dental cleanings to dental implants. We are dedicated to serving our patients dental needs and want to ensure that they always leave smiling bigger and brighter! We recommend our patients have a regular dental check-up and cleaning every six months to maintain good oral health. Dental Implants are a permanent solution for one or more missing teeth. Dr. Al has over 25 years of dental implant experience. 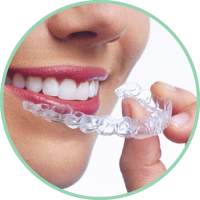 We are proud to offer Invisalign in Sudbury right at your dental office! Invisalign is a metal free orthodontic solution. Learn more about the programme and whether your child qualifies.